Source: CICH graphic created using data adapted from the First Nations Regional Longitudinal Health Survey (RHS) 2008/10, National report on adults, youth and children living in First Nations Communities. https://fnigc.ca/sites/default/files/docs/first_nations_regional_health_survey_rhs_2008-10_-_national_report.pdf -accessed July 28, 2017. 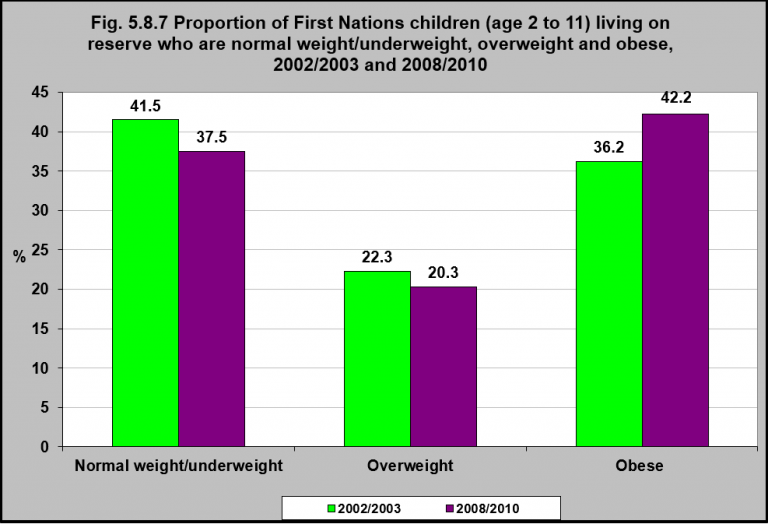 In 2008/2010, 37.5% of First Nations children aged 2 to 11 living on reserve were normal weight or underweight, down slightly from 41.5% in 2002/2003. The overweight rate between 2002/2003 and 2008/2010 did not see any major changes, remaining at 22.3% and 20.3% respectively. The proportion of obese First Nations children between the ages of 2 and 11 years living on reserve increased from 36.2% in 2002/2003 to 42.2% in 2008/2010. While there are few comparisons with non-Indigenous children, it is generally acknowledged that Indigenous children have consistently higher rates of being overweight and obese than their non-Indigenous counterparts. This places them at increased risk of obesity-related diseases like diabetes, hypertension and heart disease.1 A number of factors are associated with obesity in Indigenous children, including characteristics of the mother, physical activity, diet, body fat.2 Since children who are obese are more likely to be obese in adulthood, the health risks of obesity are great, suggesting the need for targeted health promotion programs to prevent childhood obesity in Indigenous communities.